Making its global debut at the 85th Geneva Motor Show, Suzuki Motor Corporationreveals its new compact hatchback concept car, the iK-2. The iK-2, the smartest compact car, offers all the elements expected in a car of this size. 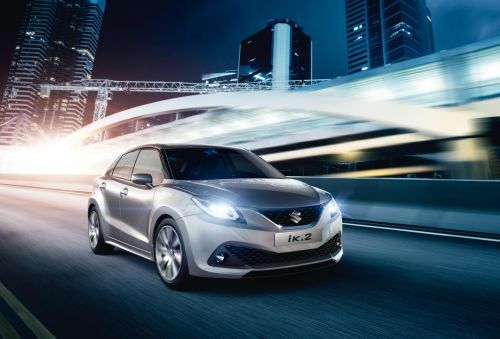 Suzuki is well known as the compact car expert, having built up unrivalled know-how in developing compact cars from the Suzulight in the 1950s and the Alto in the 1970s, to our latest model　line-up. In the iK-2 Suzuki takes the ideal of the compact car to a new level. The Liquid Flow design expresses the energetic movement of liquid, giving the car a classy, elegant, yet dynamic look. The model is built around a new-generation platform and comes equipped with the BOOSTERJET engine, a new direct-injection turbo petrol unit. By adding the production model based on this concept car to the line-up, Suzuki will give drivers a much greater value of a compact car in which Suzuki excels. The production model will also be available with SHVS mild hybrid system and is to be released in Europe in early 2016. The iK-2 is inspired by the concept of “Harmonised Force.” Harmonisation of optimised packaging by the compact car expertise, pleasant driving experience by the latest technology, and a flowing exterior design that beautifully wraps those shapes an ideal compact car. It delivers a dynamic, efficient driving performance thanks to its new-generation platform and BOOSTERJET engine. The exterior design, featuring sweeping curves all over that blend smoothly into the whole, exudes style and elegance. This is the smartest compact car packed with utmost compact car value, impressively meeting the conflicting requirements of a compact: design, utility, comfort, manoeuvrability, driving performance, fuel efficiency. The “Liquid Flow”, suggestive of the dynamism of an energetic movement of liquid with its low, wide silhouette, is inspired by three keywords: “harmony,” “elegance,” and “energy wave.” Instead of straight, mechanical lines, the body sports flowing curves throughout the body which perfectly create a harmony, conveying classy elegance. Expressive character lines that begin at the front and sweep toward the rear create attractive highlights. A series of chrome accents on the front grille and headlamps flow into the character lines on the side of the body, increasing the harmony of the whole car. An elegant, sporty profile: a cabin with sleek glass area mounted on a low, wide, flaring body. A bold, avant-garde front fascia with a wide bumper grille and distinctive LED headlamps. Muscular fenders confidently absorbing the flow of energy from the body, paired with a mechanical wheel design. Sloping rear window to channel the flow of energy forward. Lightning Silver body colour emphasises the shadows of the body with its curving lines and amplify its elegance and energy.